You can comfortably reach the main railway station Luxembourg from the airport by taxi or bus (bus line 16 Eurobus). You can make use of the train connection between Trier and Luxembourg (about 1 hour by rail). You can take the bus to Kirchberg (http://www.lux-airport.lu/en/Access--park/By-bus.4.html) and change into the bus to Trier (http://www.delux-express.de/index.php). Follow the "University" direction to the entrance (Universität Trier, Hauptgebäude, Auskunft). To pass the gate, please push the button of the intercom system and identify as a conference member. 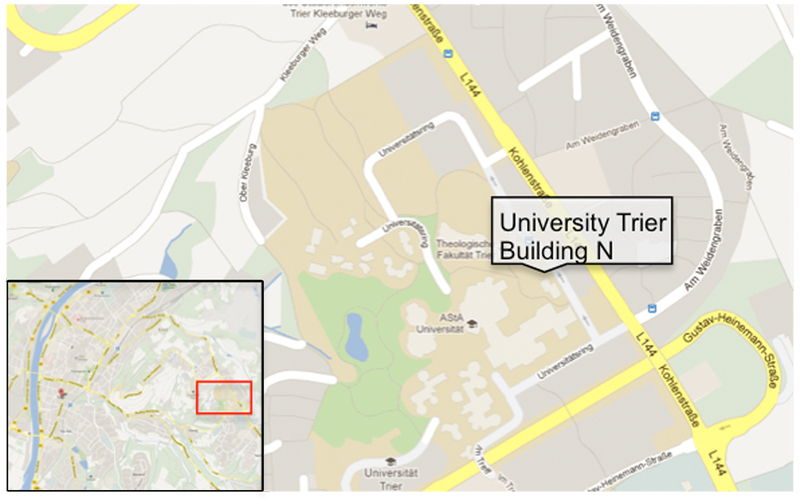 Turn right after the gate and after 50 m you will find building N (grey building) to your left. There are parking lots right next to building N.